People from different religions and nations attended a large service organized by the foundation on Easter Saturday in Haiti’s national soccer stadium to pray for the souls of the dead and a better future for its people. The meeting, attended by 1,700 people, was the largest religious event in the country since the devastating earthquake in January and marked the end of the first phase of Tzu Chi’s relief effort in the island. After the quake, which registered 7.0 on the Richter scale, struck the country on January 12, the foundation launched a global ‘Help Haiti with Love’ campaign, to raise money for the survivors. 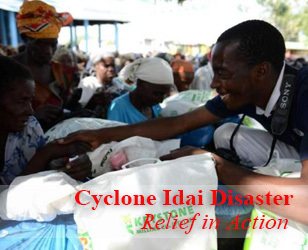 In the nearly four months since then, it has provided 260 tons of instant rice, corn powder, white rice and noodles, enough for 10 million 0.25-kg meals; the food has been distributed to more than 37,000 families at 60 venues. In addition, the foundation has donated nearly 40,000 tarpaulin sheets, 6,000 tents, 25,000 blankets, nearly 300 temporary homes and 2,800 medical kits. A total of 1,300 volunteers have come to the island in 11 teams, from Taiwan, the United States and six other countries. Their love and devotion have moved the Haitian people and the U.N. peacekeeping forces serving in Haiti, including Brazilian troops who on their own initiative invited them to the U.N. representative office in Port-au-Prince and offered their services to keep order at the prayer meeting to be held on the eve of Easter Sunday. In addition, the Tzu Chi International Medical Association (TIMA) held free medical clinics, attended by more than 15,000 Haitians. Two local doctors who took part in the clinics have decided to continue the service as volunteers in the name of Tzu Chi, after the departure of the foreign medical staff. The volunteers also organized a relief work program, in which Haitians worked to clean and rebuild their communities in exchange for three meals a day. A total of 3,700 people took part in the program. 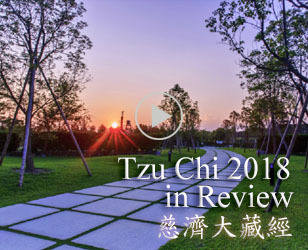 More than 640 survivors were inspired to enroll in classes to train as Tzu Chi volunteers and take on this role in the future. With the end of the first phase of the relief work, the foundation is turning its attention to medium- and long-term aid projects, such as the building of permanent schools and housing. The prayer meeting, held on March 3, the day before Easter, the most important day in the Christian calendar, was a moment both to mark Tzu Chi’s contribution over the last three months and also to join with the people of Haiti to mourn those who died and pray for the health and well-being of those who survived. The foundation invited representatives of all the country’s religions – Catholic, Protestant, Buddhist and Moslem – as well as all the nationalities there. These included U.S. soldiers, French and German policemen and U.N. peacekeepers from Jordan and Brazil. Taking part in the prayers were Jesuits, nuns from different Catholic convents, Protestant ministers and professional clergy from the other religious communities. The event began with a rendering of the Haitian national anthem; everyone stood up to sing it with enthusiasm and dignity. Then Ben Constant, the official responsible for managing the soccer stadium, and his wife read a letter from Master Cheng Yen to the audience. They spoke in English and Creole, one of Haiti’s two official languages, together with French. In the letter, Master Cheng Yen expressed her sincerest blessings for the people of Haiti, her prayers for their future and an early end to their suffering. Next on the stage was a young girl who lives in a tent in the stadium and sang a hymn in praise of Jesus, to express the gratitude of its residents for the love and care they have received from Tzu Chi over the last three months. Constant and his wife, Marie Yveleine Bois-des-Fes, had in the days before the meeting visited the different teams of volunteers to express their gratitude; they too have been very moved by the contribution of the volunteers. A local girl’s choir came on stage, to sing a song of thanks, followed by an officer of the Brazilian peacekeepers, Lieutenant Beraud, and a Catholic priest serving them, to pray with the audience. Then the officer put down his weapon and picked up the microphone to sing a song in Creole. Lieutenant Beraud said: “Let us thank God for bringing us to Haiti and coming to know Tzu Chi.” The event reached its climax when volunteers came on stage for a performance of sign language and Tzu Chi songs. They led the entire audience in a rendering of one of the foundation’s favorite songs ‘Leading the vehicle forward’. For the finale, the representatives of the four religions joined with one voice in prayer; everyone held the hands of their neighbor, regardless of race, color or nationality -- a symbol of fraternity and sharing their fortune. 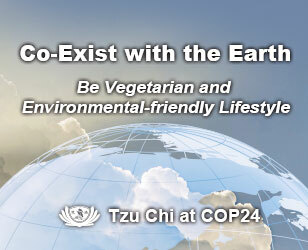 They were expressing the ideals of Tzu Chi – love and care for all and seeing the human race as a single family. For that hour, at least, those present at the service were able to forget their deep sorrows and think of a better future, with the help and support of kind and loving people from around the world.